Our Southside location is at 4320 Deerwood Lake Pkwy Unit 207, Jacksonviile, FL 32216. 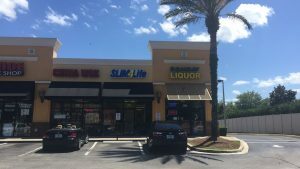 The Southside office is located in the Tinsel Town Shopping Plaza, right behind the Copelands Restaurant off Southside Blvd and Toucht on Rd. The weight loss results at Southside are amazing! The staff here will strive for rapid weight loss for each client! Many of the clients in this area live very busy lifestyles and the staff is always there to give the support and guidance needed to get them to their weight loss and health goals! The manager at this center has been able to control her type 1 diabetes though the loss of 20 pounds on the program. She cannot wait to work one-on-one with you to get you Slim4Life! Make an appointment at our Deerwood/Southside weight loss center today!